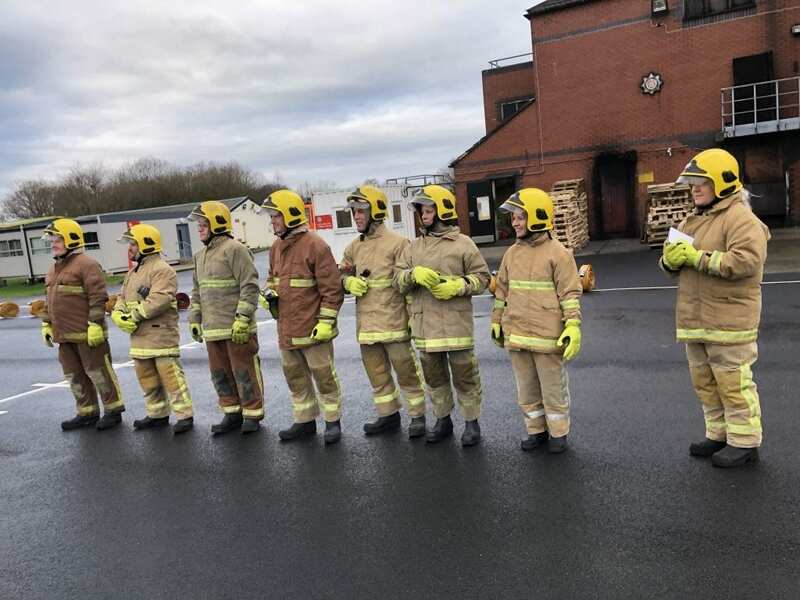 On Tuesday January 15, Aspray Franchise’s Magnificent Seven, plus one – and determine their identity as you wish – strode confidently down to the kitting-out building at Lancashire Fire and Rescue Service and prepared to go into battle for times and performances that would technically make them eligible for firefighter selection. This group of hungry and competitive men and women comprised five Aspray property claims management franchisees – Glenn Weatherall (Chester), Jaynie Ross (Bolton and Bury), Jill Kershaw (Chesterfield), Roy Bowen (Wakefield) and Nigel Cross (Warrington). Accompanying them, were Aspray’s managing director, James Whittle, its national business development manager, Colin Johnson, and project manager, Martin Grindrod. On went the unflattering trousers, the slightly spooky balaclavas, the thick padded jackets and the incredibly heavy boots, before the intrepid franchisees and franchisor representatives did a good impression of Neil Armstrong’s moon walk, as they headed to the first location for gladiatorial battle, with helmets and chunky gloves in hand. 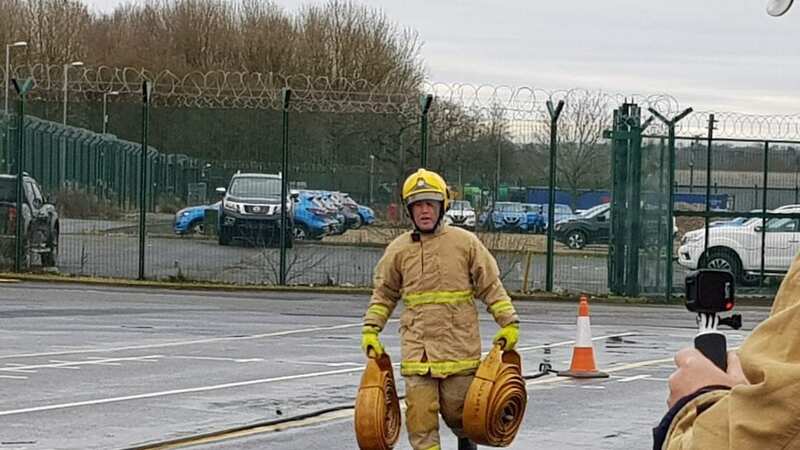 As this was a team that had collectively fought off the flu and negotiated the motorway traffic chaos of the morning rush-hour, there was going to be no stopping them as they arrived at a track divided into two halves by a fire engine. Out came the Go-Pro and from that moment, it was game on! A briefing soon told them that their fitness was about to be tested to the max. 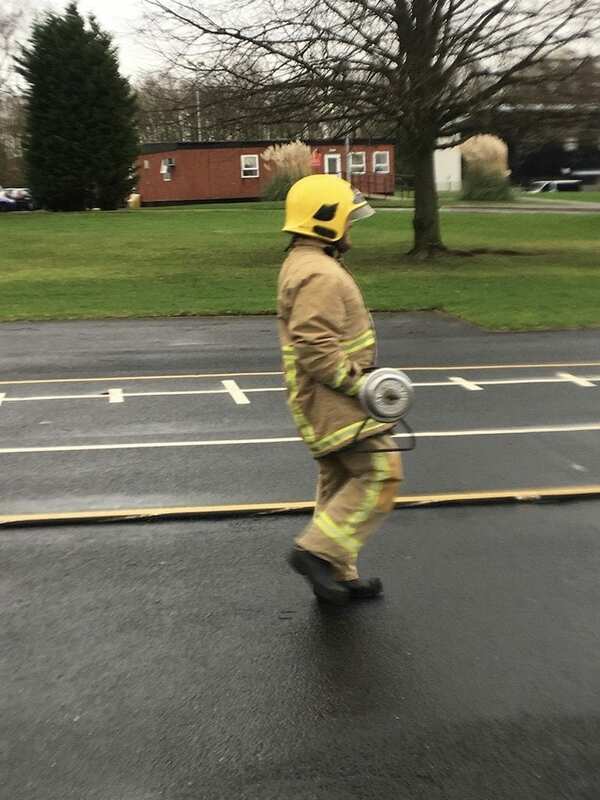 The first element of the challenge – running the hose from the fire engine to the far end of the track – seemed like the easy part, given that this would then be followed by running up and down with two full hose reels, carrying one reel up and down the track at chest height, some running up and down for the sheer fun of it in the infernal boots, a stint with a very unstable basket and a flat hose and then, just to finish them off completely, a walk up and down with an extremely heavy barbell. Going head-to-head to set the fastest time in round one were Colin, the regular 10k runner, and Martin, the young pretender. Off they set, to prove their amazing fitness levels. Seeing them complete the challenge in 4.18 minutes and 4.17 minutes respectively, before collapsing like Jenga towers, with faces as red as tomatoes, did little to inspire the rest of the Aspray franchise team. Compete they did, however, despite crossing the finishing line and declaring to a man (and woman) that, “It was the barbell that was the killer”, whilst rubbing burning thighs and quickly gulping water down. A True Test of Nerve! Next up was a true test of nerve, colloquially known as the “rat-run.” There was most definitely a touch of a bushtucker trial about this one, thankfully minus the rats and cockroaches, as each team sought to manoeouvre a several-metre-long, extraordinarily heavy, draught excluder-like prop around an obstacle course designed within what was described as “confined spaces” and did nothing to defy that description. Those franchisees and head office staff not suffering from flu chose to wear firefighter masks in addition to their other gear, as they worked their way through a cage, crawling on all fours, shuffling flat on their stomachs to get under and through impossibly low gaps, finding the strength to lift their boots and themselves over hurdles and much more. Some even managed to not just do this, but also rescue a casualty and drag them back through the course on the return leg. 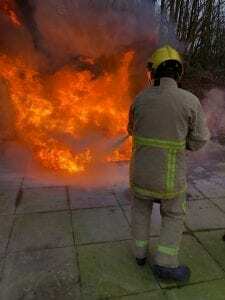 This exercise certainly highlighted how phenomenally brave firefighters need to be, bearing in mind that their vision is typically impaired by smoke, that debris could fall at any time and that a whole host of unknown factors could await them. 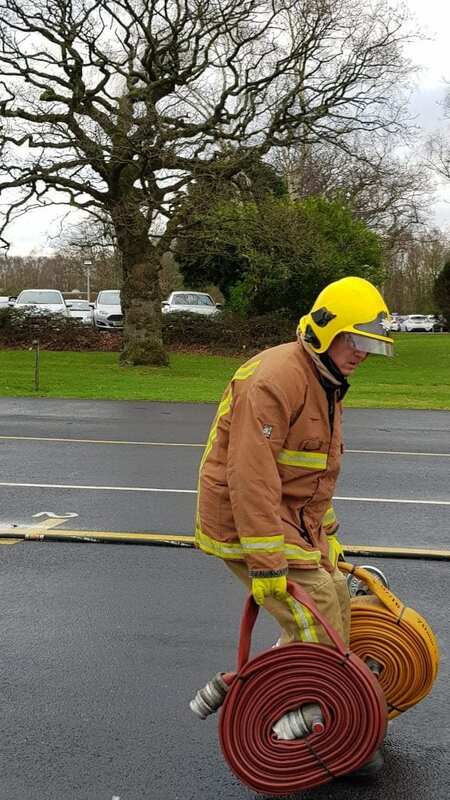 In so doing, it served its purpose as a reinforcement exercise that should drive everyone within the Aspray family on, as they seek to raise as much money as possible this year for the Fire Fighters Charity. Being a firefighter is hungry work, so a trip to the canteen was most welcome, before the first of the afternoon sessions, which was all about teamwork. Having together built an obstacle course from chairs, buckets, boxes and cones, the group worked in teams of two, with one of each pair being blindfolded by balaclava and steered through the course by the verbal instruction of the other, before arriving at the end and attempting to drop a ball of paper into a bucket, whilst still visionless. An exercise in communication, bartering and trading skills and strategic thinking followed, as three teams each sought to put together as many playing cards as possible, from individual pieces randomly distributed between teams. With some dirty tactics from the winning team, as it sought to deter another from generously swapping card pieces with the third, it would appear that the ideal Brexit negotiator probably resides within Aspray’s head office! Finally, it was back to the kit room, to put the heavy gear back on and actually tackle some fires. A bit of science accompanied this task, as the role of oxygen in fires was stressed and the capacity of steam to increase in volume highlighted. Once in the know, it was all hands to the pump – well, extinguishers – as the Magnificent Seven plus one stepped up to deal with a liquid fire, an all-ablaze chip pan, a burning electrical cupboard, a nasty and widespread range cooker fire and an inferno of a kerosene fire. 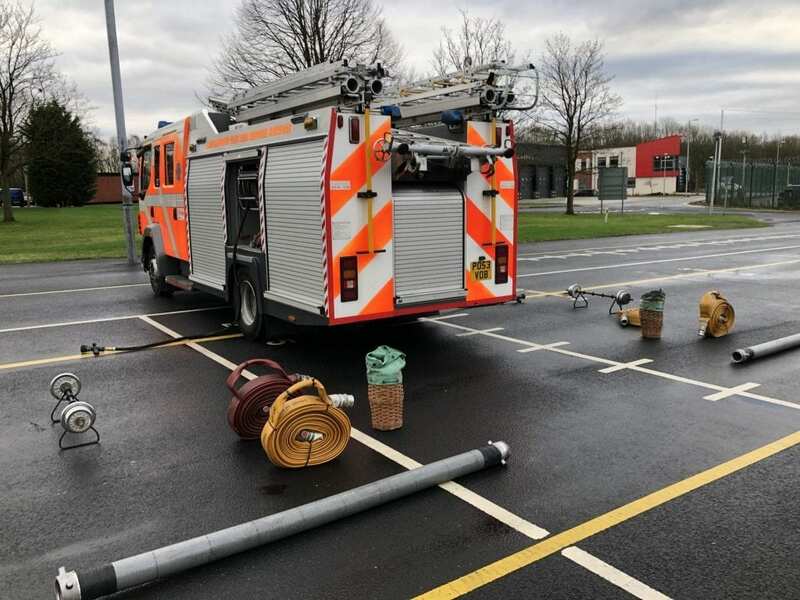 Luckily, nobody’s chin got stuck to the CO2 canister in Dumb and Dumber style, even though a few failed firefighters emerged from this exercise, by virtue of not steering the extinguishing material at the gap between fire and fluid! So what was the point of this day? Well, as highlighted, Aspray’s head office property claims team and its franchisee loss assessors in the field are determined to raise as much money as possible for The Fire Fighters Charity and paying for this day’s experience has contributed more funds to the coffers. But, secondly, the understanding gleaned from the day has been invaluable for property claims loss assessors dealing with fire damage claims – one of the major types of impact on a property that can generate a claim on an insurance policy. It has broadened the understanding of the damage a fire can do to a domestic or commercial property and given franchisees an insight into different aspects of a fire scenario that will be invaluable next time they are called in to assist a policyholder with a property insurance fire claim. And, thirdly, it has further demonstrated that the Aspray franchise family is a team – one that helps and supports each other, shares best practice and is generous with its advice. All involved will now go away and seek to raise even more money for the Fire Fighters Charity, whether that is through signing up to the charity’s raffle, taking part in car washes, or undertaking a 75-mile challenge, travelling a sponsored 75 miles by some form of transport or other, either in one fell swoop, or different stages. As explained by the wonderful Lancashire Fire and Rescue Service’s hosts on the day, Tom Powell and Jason Needham, monies raised will assist three rehabilitation centres that do not just work with firefighters, but also their families, doing a marvellous job of providing recuperation, support and health and wellbeing promotion. 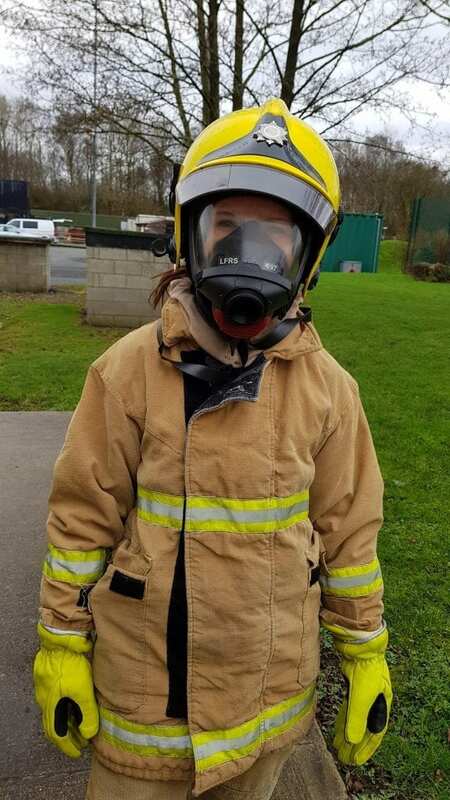 Having seen the extremely tough but brilliant job that firefighters do, Aspray is proud to have chosen the Fire Fighters Charity as its supported cause for 2019. However, Aspray is equally proud to have franchisees and employees who are not only committed and team-spirited, but also setting the world alight with their business acumen and drive. If you are interested in learning more about the Aspray franchise, leave your details and our sales manager will get back to you. UNDER REFERENCE 466101 FOR CLAIMS HANDLING ONLY.